Life can be difficult, nothing is ever going to be fair, and people will hurt you - learn to accept what you can not change, it will help you in the long run. Remember to always embrace the moment, time is fleeting and you will be "old" before you know it. I'm sorry that you have hurts, I'm sorry the world isn't perfect, but life is pretty good most of the time - you just sometimes have to remind yourself of this fact. Money isn't the most important thing in life, strive to feel like you've accomplished something beyond monetary means - always feel passionate about what you do. Your body is perfect the way it is, no matter what height,size,shape,etc. 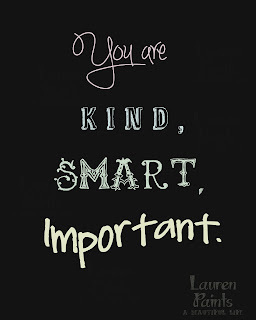 you are. Not everyone is going to like you, it doesn't matter, just be proud of yourself and always know that you are kind, smart, and important. Most of all love yourself.